Is This the Longest Comfrey Root, or What? I planted a tiny root cutting of comfrey (Symphytum officinale) in 1994, in a prime spot in my front garden. I love this plant so much. I first read about it in Jeanne Rose’s Herbs and Things book twenty years before. Comfrey has recently been a conversational subject that has connected me with the South Florida herbal community, with a foodie/herbal friend who is writing a book on culinary and healing herbs, and today, maybe a fun fact. Is the root that my apprentice Paula Diaz harvested for me the longest darn comfrey root ever?! Click the image below, if needed, for viewing details. One site says that the roots can go down ten feet, another says lateral roots can grow to three feet. Confirmed? Or just info copied from books and repeated. Does anyone have any proof with photos? I spent a lot of time googling about comfrey roots and length, and didn’t find one photo of any longer. I’ve never seen one longer, and I’ve grown comfrey since the 70s. Click image to enlarge for detail. My connection with comfrey and local folks started a few years ago when I found out local herbalist Julia Onnie-Hay was conducting a comfrey salve workshop at Earth N Us farm near my house. I met her, and had so much fun connecting with someone over this powerful plant. 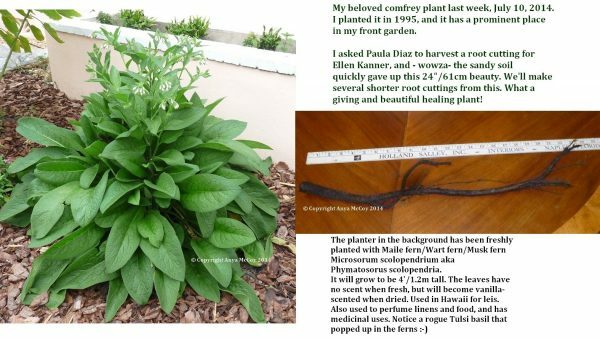 I don’t harvest the comfrey leaves of my plant often for frequent healing purposes because when it’s grown in the tropics, far from its native steppes, it can develop an overabundance of alkaloid that can harm the liver – hepatotoxic pyrrolizidine alkaloids (PAs). So, I purchase it from northern growers for poultices, teas, etc. So, last week I called local writer, food maven and dear friend Ellen Kanner when I needed to take a break from writing my book Perfume From Your Garden, because I knew she could offer sympathy at how isolating and time demanding book writing can be. (Her award-winning Feeding the Hungry Ghost: Life, Faith, and What to Eat for Dinner made her hole up for months at her keyboard, and I was now at the “been hold up too long phase” and gave her a call. She quickly told me she was working on a new book proposal, and said it would involve herbs. Which one are you working on now, I asked? “Comfrey”, she said. I couldn’t believe it. Comfrey is rare in South Florida, and hearing her say that was her research subject right now surprised me. So I began to tell her how I have loved it for forty years, and I have a twenty-year-old one in my front garden, and would she like a cutting? That brings us to the freaking longest comfrey root I’ve ever seen. I mentioned how I haven’t really harvested that plant because of the alkaloids. I’ve harvested some leaves over the years for a quick poultice, but that’s it. I’ve never harvested the root at all. I remember telling Paula, jokingly, that the leaves never seem to die back, maybe they’re all twenty years old. We had a giggle over that, the never-aging comfrey leaves. So, today Paula and I went out to harvest the root. She had her gloves on, and gently worked the soil, quietly bent over, feeling around, and within five minutes pulled out this huge beauty of a root. Paula is an herbalist, and grows a lot of comfrey, so she’s aware of the typical roots, too. It took it a while for it to sink in, and we couldn’t find evidence of such a root length anywhere. Anyway, to sum it up: comfrey rules, and I love it, and I’m very happy with this gorgeous root. 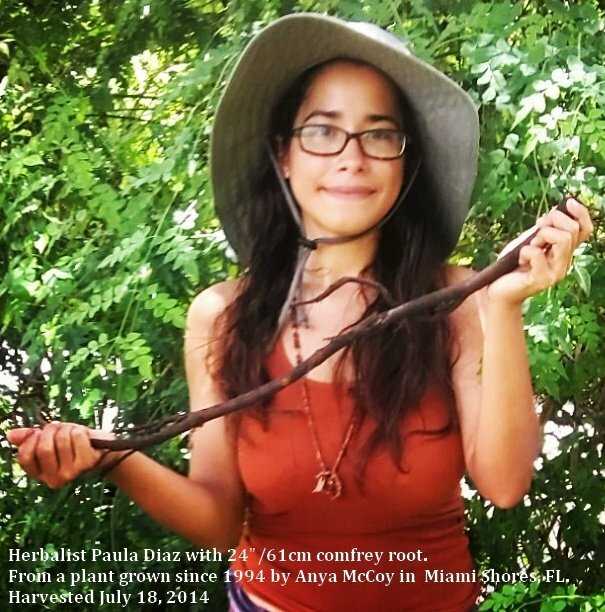 This entry was posted in Anya's Garden Perfumes, Herbalism and tagged comfrey root, Ellen Kanner, longest comfrey root, Paula Diaz on July 18, 2014 by Anya. Wow! Was it growing down or laterally? Yes, it was a lateral root. Sandy soil gave way easily to prevent the root from breaking. Yikes, I will go out and move my Comfrey plants before they end up in my neighbor’s yard. Thanks for the information.